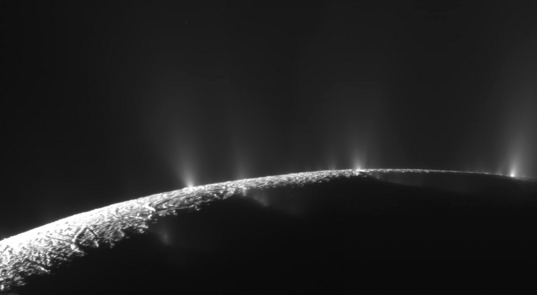 I'm getting to be a broken record here, but I can't stop looking at these photos from the Enceladus flyby. This first one I put together from two of the south polar plume images -- you can see all four of the tiger stripes, and the plumes issuing from them, in this wide shot. I mosaicked two images, matching their levels, rotated them 180 degrees to put "ground" at the bottom and "sky" at the top, and filled in a little of the background in the corner at lower right to fill out the whole image. This other one was put together by Gordan Ugarkovic -- Cassini flies into the plumes! Cooooool. Wish I could have been riding along. That would be one spectacular view. This four-frame animation is composed of images captured by Cassini as it approached for its close flyby of Enceladus on November 21, 2009. The brightest plumes in this animation are along Damascus sulcus. Plumes along Baghdad sulcus are also visible at the beginning of the animation.